In a former day-job life, Colleen researched, worked and helped to develop a destination wedding blog for a travel company. Although she’s recently switched gigs, she’s still got a lot to share on the subject. For more general travel recommendations and creative inspiration, you can check out Colleen’s blog, flee fly flown. He popped the question, you said, “Yes!” you both decided on a destination wedding, what next? A traditional beach wedding somewhere warm with friends and family? On a vineyard in Napa? A private affair across an ocean? * Guests: While choosing a destination wedding may seem cheaper for you as the couple getting married, consider your guests upon determining when and where you’ll be having your nuptials. When guests plan on attending a destination wedding, they’re committing more financially than they might have if attending a wedding closer to home. If planning a wedding at an all-inclusive resort somewhere in Mexico or the Caribbean, chances are your guests will plan to get a little relaxation time in, along with the festivities. Finding the balance between an action-packed wedding getaway versus time for guests to relax and get to know each other should also be considered. * Cost: A destination wedding is often cheaper for the bride and groom to put together. Many beach destination hotels and resorts have wedding planners on staff that will put all of the details together for you, no matter how large or small the wedding. When determining which hotel, resort or other venue in your destination of choice, inquire into their wedding planning services and costs. Planning something a little more off the beaten path? You may not find as many venues with on staff wedding planners, but wedding planning services are most likely available in some shape and form. Consider a wedding planner who specializes in destination weddings or work with a travel agent who has put together other destination weddings. Also, consider the cost of what your guests will be paying. By having a destination wedding, it’s often cheaper for the bride and groom, but the cost for your guests jumps up. Also, be sure to invite your guests further out from the wedding that you would at home. This allows for better planning and budgeting for your guests. 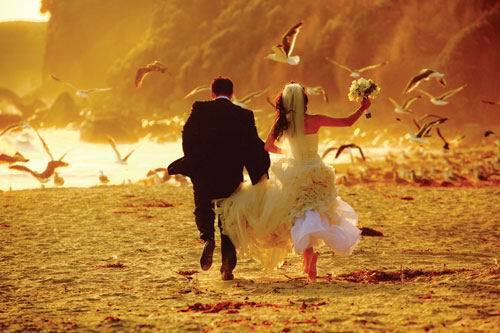 * Time of Year: You’re planning to escape from the cold and snow, to a warm and sunny destination to get married. Great! But not all warm climates have the same warm seasonality. Consider things like hurricane season in the Caribbean (typically June through November) or the rainy season in Hawaii (typically November to March). Note: There’s no guarantee the weather will be perfect even if you avoid the inclement seasons, but it’s good to consider as you’re deciding when and where to have your wedding. * Scale: Just an intimate wedding for two built into the beginning of your honeymoon? Or a big beach bash with 150 of your closest friends and family? When deciding the scale of your wedding, consider how you’ll manage the outlying factors. Maybe you and your husband-to-be really want to keep it a private affair, but want to find a way to celebrate with friends and family as well. Consider having a lower-budget reception or celebration upon your return. That way, the two of you get the best of both worlds. Also, consider the amount of people you are able to reserve rooms for at the resort or hotel at which you’ve chosen to block rooms. 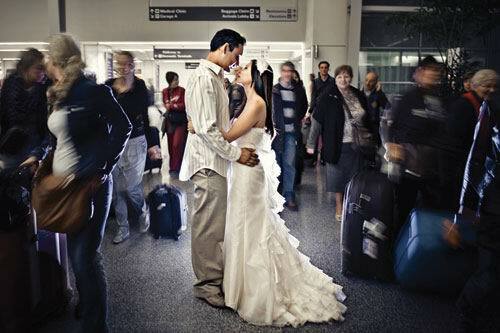 * Besides the wedding: When traveling for a destination wedding, your guests are all in one place for more than one day. Consider what other activities you’ll be providing for your guests to make the trip even more special. Will everyone be invited to the rehearsal dinner? Will there be a day-after brunch? What about a special guided tour around the island? How about welcome gifts and buttons for guests to identify each other so they know who else is attending the wedding? * Travel: It’s not expected for the bride and groom, or their families, to pay for their guests’ flights or hotel rooms when hosting a destination wedding. However, do consider the price that they will have to pay when working with a resort and definitely consider flight schedules, cost and accessibility to your chosen destination when determining your wedding spot. Also, be sure your wedding party plans their arrivals with plenty of wiggle room. A destination wedding can wait for no one. If the groom or a bridesmaid plans to arrive just a few hours before the wedding and has a flight canceled thanks to weather, there isn’t much that can be done about it. Of course these things can happen no matter where you get married, but when everyone is traveling to a destination, it’s best to plan for extra travel time for just in case of unexpected delays. * Wardrobe: There are definitely a few things to consider when determining both yours and your wedding party’s destination wedding day wardrobe. For one, heat. Are you going to make the groomsmen wear a heavy 3-piece suit or coat and tails in 95-degree weather? Are your bridesmaids expected to wear heels on the beach? Are you planning on carrying a heavy, ball gown-style wedding dress on the plane and squishing it into the overhead compartment? If you’re the no-frills, keep-it-simple bride, some of these issues may not even be a problem, but for those of you who want it all, keep packing logistics and temperatures in mind. Also, be sure to check the Tourist Board of the destination you choose, chances are they have local planning resources available on their website. Congratulations on your engagement and happy destination wedding planning!